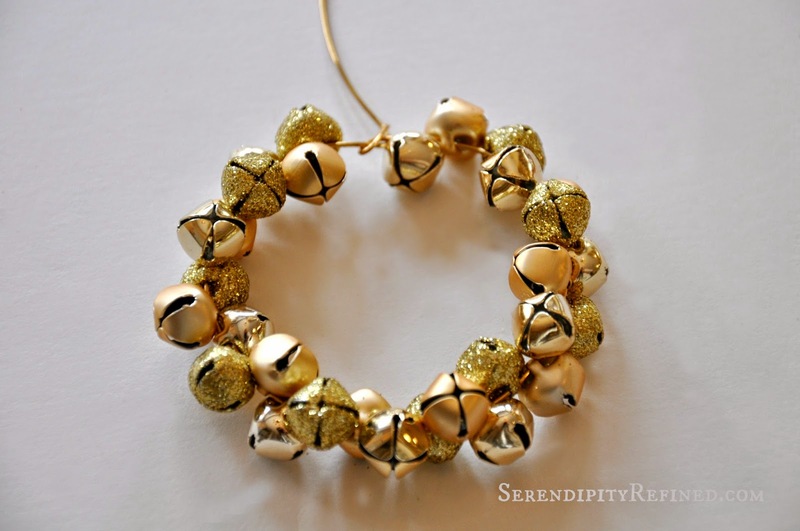 Today's gold jingle bell wreath ornament is a great easy ornament to make with children. All they need a little help from an adult to bend the wire. This adorable wreath would also make a cute napkin ring for your holiday table or a darling package tie-on for an extra special gift! 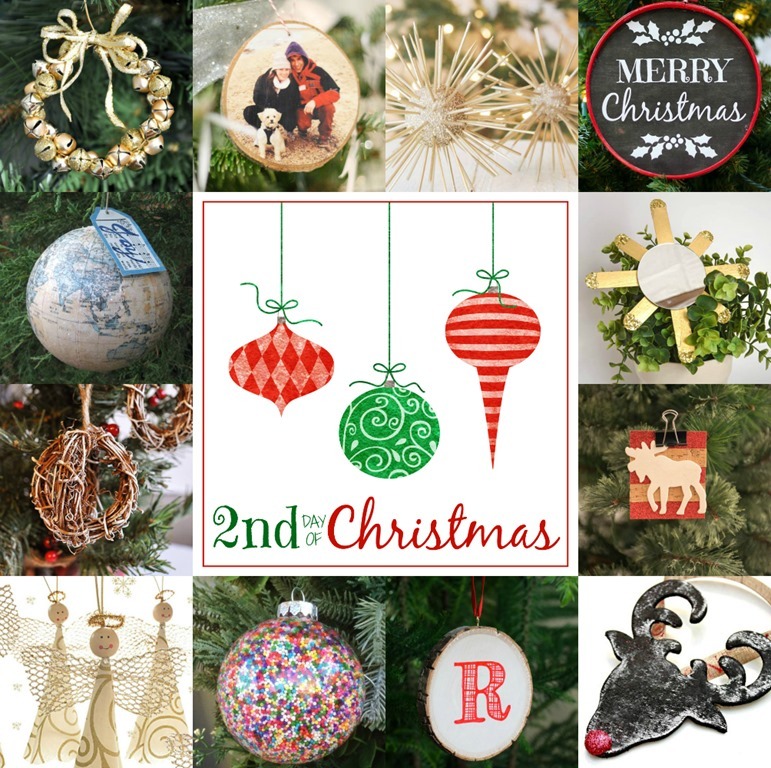 Some of the products that I used to make the ornaments for this series were purchased with a gift card which I received from Michaels. All choices regarding sources and products used in these posts are my own. 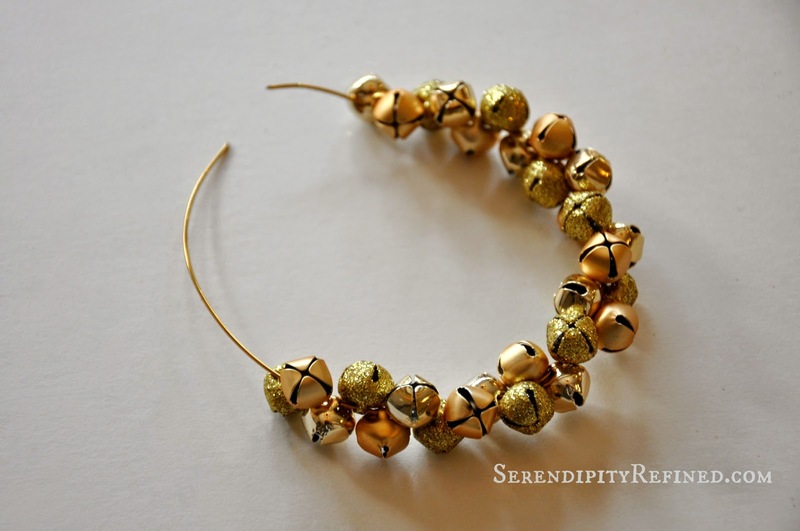 Loosely form the gold wire into a circle. If you're good at it, you can do this by hand. I find that it's easier for me to bend it around a bottle of hand lotion or craft glue that are generally sitting right next to each other near the kitchen sink. ( I know, don't judge.) You will also notice that I said, "gold wire". This is because I saved you the trouble of first using green wire and then silver wire. The wire shows...and it doesn't look as nice. Trust me...just get the gold, save yourself some time. Next, thread the bells onto the wire. If they are all the same color, this will probably take approximately sixty seconds. If they are four different shades of gold and you're a perfectionist like I am, it will take about fifteen minutes of putting them on and taking them off in different patterns until you finally realize that simply alternating each of the four colors works the best. 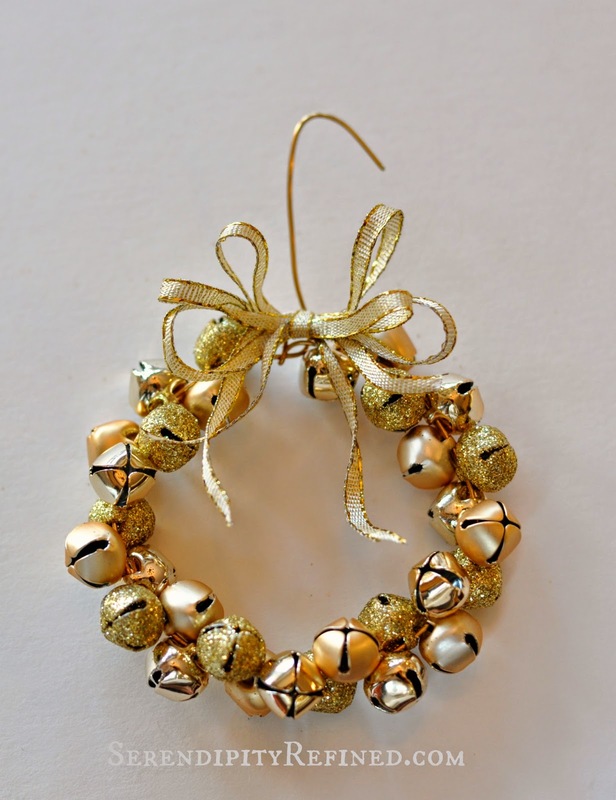 Hey...I just figured out that I probably could have made an ombre jingle bell wreath! Oh well, maybe next year. 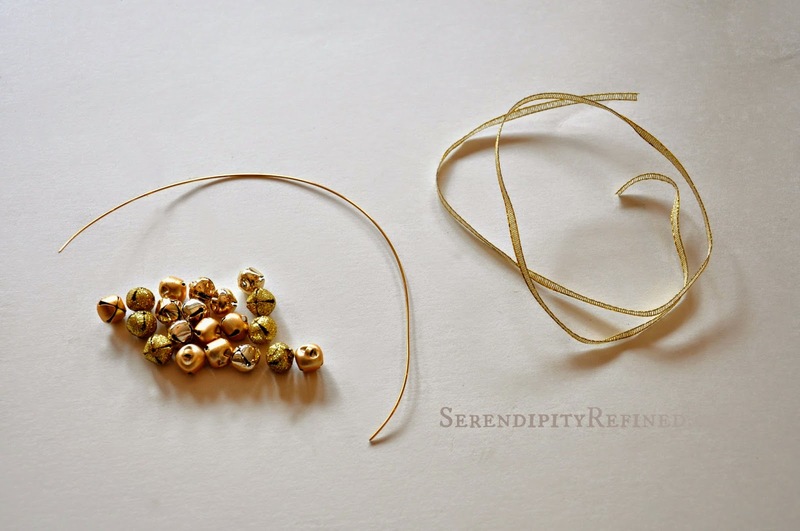 Adjust the bells by twisting them then, using needle nosed pliers, bend one end of the wire around the other to form a loop leaving about two inches at one end of the wire. Form a hook on the longer end. Pinch the loop tight to secure the wreath. Tie a 4 inch piece of ribbon around the hook where it meets the loop of the wreath. Form a bow from the remaining ribbon by looping it back and forth. Tie the loops to the four inch piece of ribbon on the wreath. Or, buy a miniature bow and hot glue it on. I happen to like making bows...and using glitter...especially this time of year. Don't forget to visit the other eleven bloggers to see what they're up to today by clicking on the links below.! 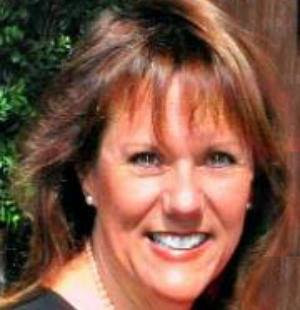 My very special thanks to my dear friend Linda from It All Started With Paint Blog for organizing this fun event! Joy to the World Ornament by Lovely Etc. 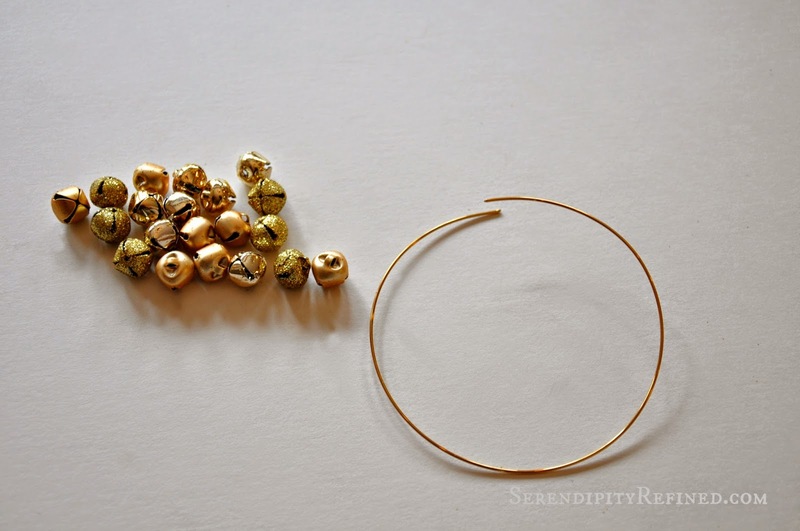 Simple gold mini jingle bell wreath ornaments...I hear that they're all the rage this year. Or at least they will be if I have anything to say about it. Be a trend setter, make a couple for yourself! 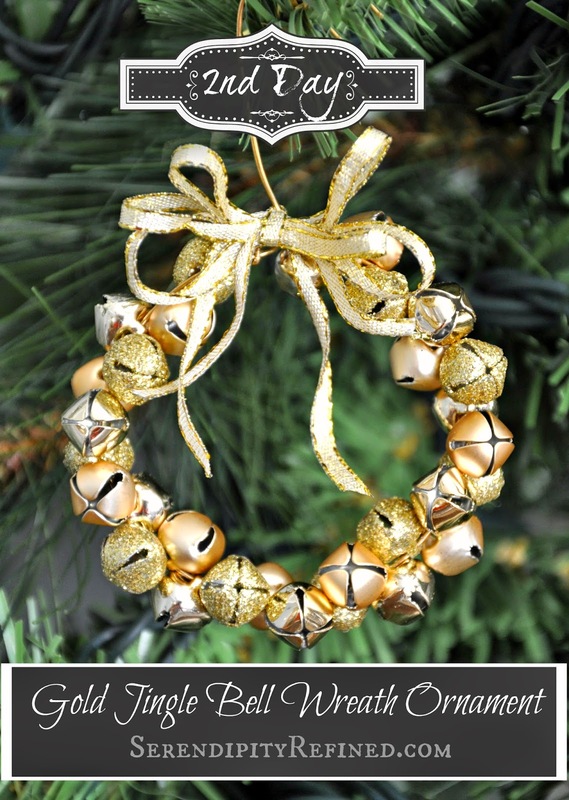 Stop by tomorrow for a DIY monogrammed glass ball ornament. 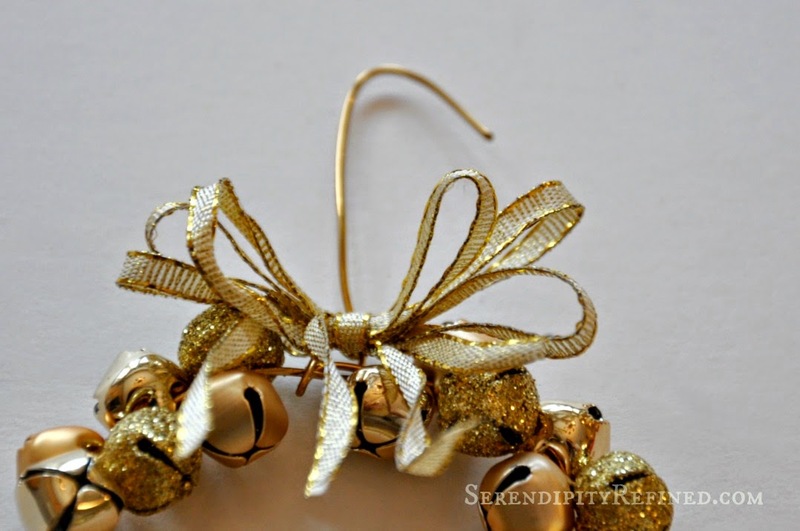 Click this link if you'd like to see th yesterday's ornament: Easy Gold Reindeer Head ornament .